The Hicker camper parked at at one of the many sites at the Mistagance Campground at La Mauricie Natioinal Park in Quebec, Canada. Autumn leaves begin to cover the landscape at the Mistagance Campground in La Mauricie National Park in Quebec, Canada while our camper parks for the evening amongst the peaceful scenery. There are approximately 108 sites at this campground but during the Fall, you will not have any problem finding an open one. Hicker Camper at Mistagance Campground at La Mauricie National Park, Mauricie, Quebec, Canada. 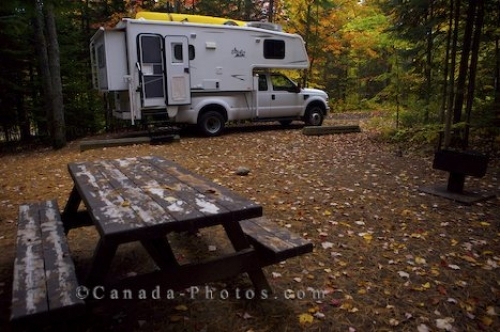 Picture of the camper parked at the Mistagance campground at La Mauricie National Park in Quebec, Canada during the Fall.